The red blood cells here are normal, happy RBC's. They have a zone of central pallor about 1/3 the size of the RBC. The RBC's demonstrate minimal variation in size (anisocytosis) and shape (poikilocytosis). A few small fuzzy blue platelets are seen. 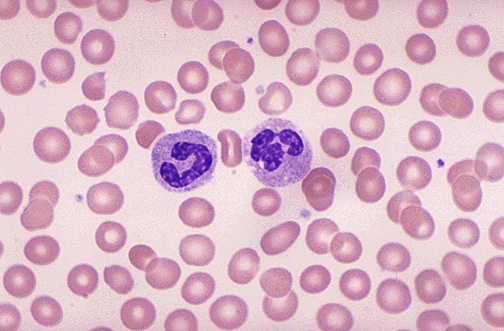 In the center of the field are a band neutrophil on the left and a segmented neutrophil on the right.